Thousands Of Hondurans Waiting For Word On Special Permission To Stay In U.S. : The Two-Way Nicaraguans who have been covered under the same temporary status have been told they have just over a year to leave the country. 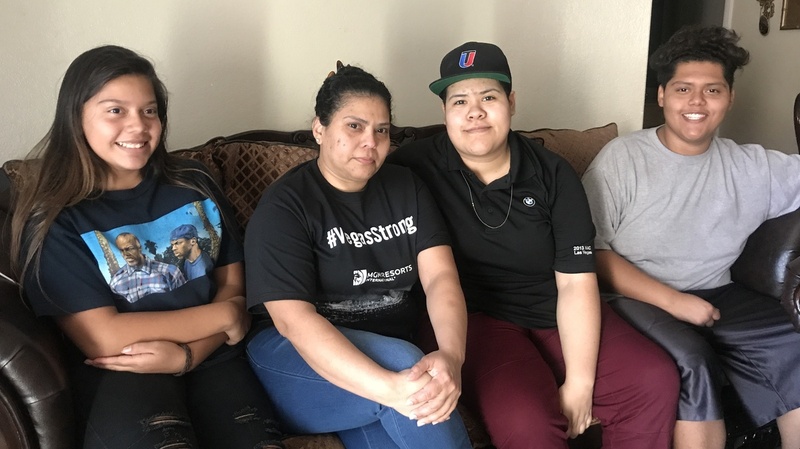 Thousands Of Hondurans Waiting For Word On Special Permission To Stay In U.S.
(From left) Nazareth Jiménez-Garcia, 13, her mother Francis Garcia, 41, her sister Frances Arleth Garcia, 20 and her brother Uriel Guevara Garcia, 17. Some 86,000 Hondurans remain in limbo after the acting secretary of the Department of Homeland Security, Elaine Duke, couldn't decided whether to extend or cancel their permission to stay in the U.S. But the department has given about 5,300 Nicaraguans notice that they have just over a year before they have to leave. The two groups are covered under Temporary Protected Status which allows them to live and work in the U.S. after a storm ripped through their home countries while they were already here. The TPS-covered Nicaraguans, who have been living in the United States for at least 18 years, now find their protection cancelled with a delayed effective date. Senior administration officials say that delay is to allow Nicaragua time to get ready for the return of its citizens. Immigration advocates said the failure to come to a decision on Hondurans, who face returning to a country rife with violence, is unprecedented and leaves the community in a punishing period of uncertainty. Without a decision, the Hondurans get an automatic extension of six months, meaning they won't have to leave in January but still don't know their ultimate fate. An estimated 200,000 Salvadorans and 50,000 Haitians are also waiting on decisions in the coming weeks because their status is set to expire early next year. TPS is given to people already in the United States whose home country is devastated by a natural disaster or roiled in ongoing-armed conflict. The decision to keep or cancel the provisional status has to be made 60 days prior to the expiration date. It's a nightmare for more than 320,000 people who've put down deep roots in the United States, from buying homes to having children. Some 85 percent are active members of the labor force, about 30 percent own homes and among them they have tens of thousands of children born in the U.S.
People like Francis Garcia who has lived here for 21 years and works at the MGM Grand in Las Vegas. She's a mother of three U.S.-citizen children. And at 41, she's lived in the United States longer than she did in Honduras. "It means separation," she said just before Monday's deadline. "It's a nightmare. I don't want to think about that. It's very hard." She stopped speaking to try to hold back tears. She sat at the dining room table in the three-bedroom apartment she lives in with her children, the youngest 13 years old, and the oldest, 20. "It's really hard to be separated. I wouldn't like to take my kids back to my country," she said. "It's really dangerous. Honduras is really bad." When Garcia came to the United States, she took the risk to cross the border for economic reasons. But today Honduras is plagued by drug-fueled gang violence and has one of the highest murder rates in the world. In 2015 the National University's Violence Observatory reported that Honduras had a homicide rate of 60 per 100,000 residents. Salvadorans are living with similar violence in the northern triangle of Central America. "I love my country. I have no problem going back. But it's not the place for my kids," she said, worried that her children will be kidnapped for ransom because they're American. "They are very young. I don't want to put my kids in a situation where they're going to put a price on my kids." Many immigration experts question what appears to be the administration's intention to end protected status for so many, at a time the home countries can't absorb them back and when they're so heavily integrated in the United States. They call the ongoing uncertainty "cruel." "A lot of people will suffer," said Royce Bernstein Murray of the American Immigration Council. "They've been heavily vetted. Hondurans and Nicaraguans have had their fingerprints taken 13 times. They're paying taxes, they're paying to benefits systems and they can't take out those benefits through Social Security and Medicare. So over all they're a net positive for us and I just don't see any benefit to ending TPS for them." And there will be ripple effects, she says. If people can't work, they can't pay for their homes and that means foreclosures. The millions of dollars they send to their families in their home countries will stop. Murray says this will only cause more instability in the northern triangle of Central America and it will lead to more migration. Already, so many people are fleeing a combination of violence and economic insecurity. But hardliners like Mark Krikorian from the Center for Immigration Studies said the current administration needs to end the program and Congress needs to find a solution or President Trump will undermine the tough-on-immigration platform he promised. "Temporary Protected Status is supposed to be temporary. It was never intended to be a permanent status and yet what has happened over successive administrations is that it keeps getting renewed over and over and over again," he said. A senior administration official said that the Department of Homeland Security is assessing the provisional status country by country. And while the department realizes that when Nicaraguans' status expires in 2019 they will have been in the United States for 20 years, this is a problem for Congress, not the administration. "If Congress wishes to find a solution to find them a permanent status rather than this 18 month to 18 month fix that has been going on for decades," then that's something it should do, the official said.